In a partnership that was announced over a year ago, automaker GM and telecom giant AT&T are starting to roll out product — cars with built-in online connectivity. With announced prices, these cars and data plans help shape consumer understanding of an important question: What is the monthly cost of connecting a car? Existing AT&T customers, and existing OnStar (already a GM partner) customers will get the best deals. Part of AT&T’s plan is to attract customers away from other wireless providers, in addition to harvesting incremental revenue from monthly payments. AT&T customers will be able to add hotspot activation in 30 GM models across the Chevy, Buick, Cadillac, and GMC car lines. An extra $10 per month added to an AT&T bill gets the car added to the customer’s list of devices that share the bill’s data plan. That price will probably be compelling for many users, and encourages the idea that a car is a consumer electronics device, like a smartphone or tablet. The $10/month price point is identical to the cost of adding a tablet to an phone plan. Non-AT&T drivers can activate the car’s Internet service by paying GM. In that scenario, OnStar subscribers can get 200MB of streaming data for $5 per month. Two-hundred megabytes doesn’t go far with streaming music or other media, but is adequate for many business tasks such as email and light document-sharing. Other OnStar-discounted packages go up to $150/year for 10GB of use during the years. Non-OnStar users will pay $200 for that plan. There is no report of an unlimited data plan that is unhooked from AT&T. 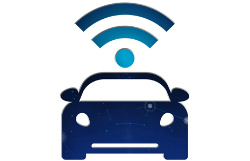 For users seeking in-car connectivity without a ceiling, the best bet might continue to be hooking an unlimited-plan smartphone up to the dashboard. This could actually lead to price fixing charges against any and all car makers, phone providers, and ISPs if it holds true. We already saw this with the data plan usage capping, that was decided at CTIA in 2009 or so, and everybody started capping data usage caps at that point, and there are articles on this blog’s archives about the sudden onset of data usage caps. The problem is the amount of data being restricted to being almost universal from carrier to carrier, the speed tiering, the pricing of plans, and several other factors. I’m very surprised the Department of Justice has not started a serious major investigation that could send some of the company bosses to jail for the data plan usage capping matter, etc., including everything I’ve mentioned. Amulyam was the first company in India to sponsor free recharges through Ad-viewing Naturally it wasn’t going to lag behind in the app-for-recharge race.